Britain must scrap the European Convention on Human Rights (ECHR) in times of warfare because British soldiers cannot fight under the restraints of “judicial imperialism,” a right-wing think tank has claimed. Offering enemy combatants the right to sue the British government and expecting soldiers on the battlefield to operate with the same level of caution as police patrolling London streets will render future foreign combat operations unworkable, a report by Policy Exchange said. The study, “Clearing the Fog of Law,” has placed human rights back on Britain’s general election agenda. It was authored by two academic lawyers and a Tory general election candidate. The report conceded that UK soldiers fighting abroad should not act with impunity. But it argued international oversight of conflict should fall under the Geneva Conventions rather than the European Convention on Human Rights. Under such reforms, the European Court of Justice would hold no power in Britain and final judicial authority would rest with the Supreme Court. Policy Exchange's report says the “judicialization of war” has increased markedly since Tony Blair’s New Labour introduced the Human Rights Act in 1998. 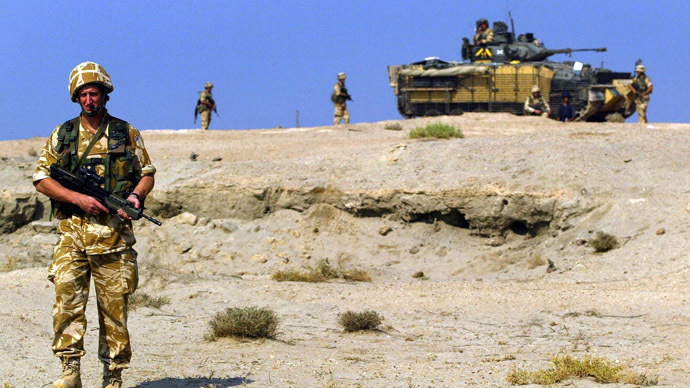 At present, an estimated 1,230 lawsuits have been filed against the Ministry of Defense by grieving families of Iraqis gunned down by British soldiers. Iraqi claimants seeking justice for their deceased loved ones argue Article 1 of the European Convention on Human Rights (ECHR) should also apply to those shot by UK armed forces during Britain’s 8-year occupation of Iraq. The legislation compels states to respect basic human rights in the jurisdictions they govern, including the right to life, the right to freedom from torture, and the right to a fair trial. While the MoD rejected the argument that Iraqis killed during UK security operations fall under Britain’s jurisdiction, the High Court ruled against the British government. In addition to the lawsuits filed by families of grieving Iraqis, a further 1,000 private law claims are also making their way through British courts, Policy Exchange says. The think tank’s report warns of the rise of “judicial imperialism” in Britain. It claims this trend is particularly in evident in the application of the ECHR to UK forces on the battlefield. “British armed forces remain the most accomplished in Europe; but they suffer courtroom defeat after courtroom defeat in London and Strasbourg,” Policy Exchange’s report said. The tipping point, it suggested, was the landmark case of Smith v Ministry of Defense in 2013. The court’s ruling, given at Britain’s Supreme Court, said that soldiers injured in battle or the families of those who died on the battlefield were entitled to sue the British government on two counts: for negligence and for violations of “the right to life” under Article 2 of the European Convention on Human Rights (ECHR). By contrast, the ECHR permits combatants to use lethal force only in exceptional circumstances or where there is no other option. It also says the UK has a duty to investigate claims of wrongdoing committed on its behalf. “Negligence as a concept has no place on the battlefield as it leads to a ‘safety first’ approach by commanders on the ground,” the report said. “All injured personnel should be paid compensation in full on a no-fault basis. The money would go to injured soldiers and their families rather than to personal injury lawyers and the public costs of trial,” it added. Policy Exchange’s call for an end to “judicial imperialism” and wide scale human rights reforms in Britain will be welcomed by certain pockets of the Conservative Party. But human rights NGOs and those committed to preserving Britain’s human rights framework will likely dismiss the proposals as hawkish and misguided murmurings from the right.